Fill your home with the festive scents of the holidays. Try Febreze’s limited-time holiday scents while they are still in season. 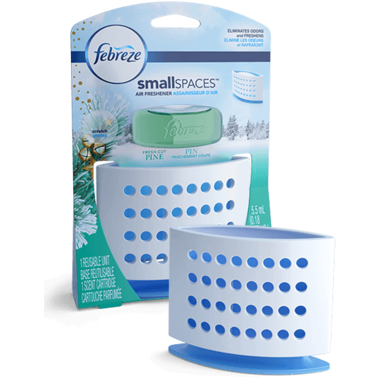 Febreze SmallSpaces air freshener eliminates odours and freshens for up to 30 days. It's a one-of-a-kind way to keep your home's spaces smelling continuously fresh. When you adjust its base, Febreze SmallSpaces gradually releases your desired amount of freshness. Febreze SmallSpaces works best in small spaces like laundry rooms, bathrooms, and mudrooms. It's great for putting next to hampers, in dorm rooms, under sinks, and near shoes in closets because it’s virtually mess-free and requires no plugs or batteries. The sleek, compact design fits perfectly into any décor and works wonders from bathrooms to bedrooms, all month long. Enjoy Febreze’s holiday scents in a variety of ways, including Air Effects, Fabric Refresher, CAR Vent Clips, NOTICEables, SmallSpaces, Candles, and Wax Melts. Smell is mild, but pleasant. Any chance you could start selling just the refills? I have two of the holders now. I like all Febreeze products. Good price for the unit and I needed to replace my very old one. Scent is unobtrusive which is a pleasant surprise. I really like this scent, it smells like real fresh cut pine. I'd buy the frangrance packs again when they're available.